Now I know what you’re thinking…. Almonds? That could be good! I’ll be the first to admit I had my doubts. See, pistachios are my moms favorite. So every year for her birthday I try to incorporate them into whatever I bake her. This year I wanted CAKE!! Aren't the pink and green just lovely together? I wanted honest to goodness made from scratch cake! Let me tell you. This cake did not disappoint!!! 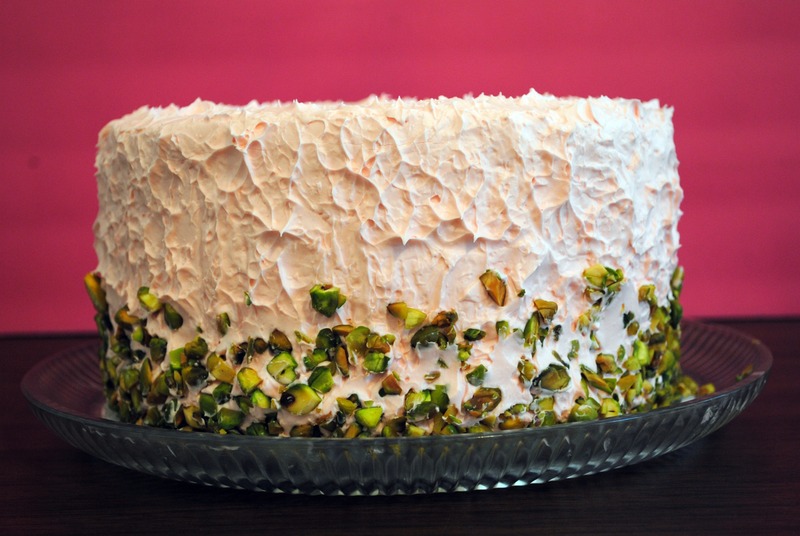 Up until I made this cake I didn’t think I liked pistachios, but I was wrong. 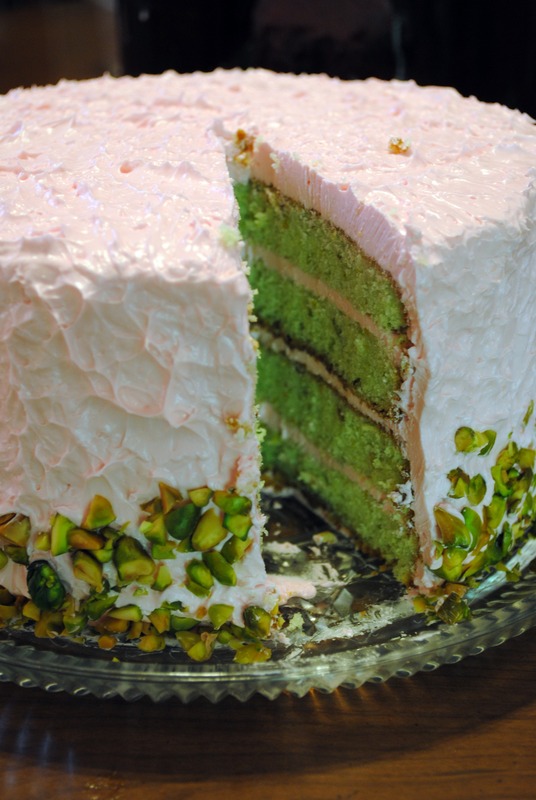 Even if you don’t think you like pistachios give this cake a try. I know it surprised me. Pre-heat oven to 350. Prepare 2 8x3in round pans. Cream the butter, sugar, and Jell-O until fluffy. Beat in the egg yolks on at a time until well incorporated. Alternately add the flour and milk, ending with the flour. Mix in the almond extract. Stir in ground pistachios. In a separate bowl whip the egg whites, not to stiff. Fold whites into batter, being careful not to over mix. Divide between pans. Bake approximately 20 minutes or until pick inserted into center of cake comes out clean. Cool 10 minutes before removing from pans. Allow cakes to cool completely before frosting. If desired split each layer in half creating a total of 4 layers. Using the Kitchen Aid wipe down the bowl, whisk attachment, and a rubber spatula with white vinegar to remove any grease. To the bowl add egg whites and sugar. Place bowl over a pot of simmering water. Do not allow the bottom of the bowl to touch the water. Simmer until the temperate on a candy thermometer reaches 160 degrees. Remove bowl from heat and place onto mixer. Whip until thick, glossy, and cooled. Switch to the paddle attachment and set mixer to medium. Add butter in small cubes. Continue to whip on medium. Mixture will begin to look curdled, but will come back together after whipping. Add vanilla, melted chocolate, and food coloring. Use to frost cooled cake.